Home → Blog → Bergerac Blanc 2015, Mayne de Beauregard. 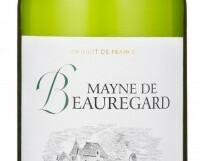 Bergerac Blanc 2015, Mayne de Beauregard. Clean waxy yellow apple fruit with plenty of aroma and verve. Great value at €11.79 too. A good all-rounder to drink with fish, seafood and lighter pasta dishes, as well as white meats. Down in southwest France, in a large area that includes Bordeaux and Bergerac, they have always done things slightly differently. Here Sauvignon Blanc is always blended with Sémillon, a lesser known and very underrated grape variety. Sauvignon is fresh and crisp, whereas Sémillon is lower in acidity and broader in the palate. Blend the two together and you get the perfect combination, often much more interesting than a plain Sauvignon. This week’s wine, from Marks & Spencer, is a mix of 80% Sauvignon and 20% Sémillon from Bergerac.